The Queen visited a horse racing stables, a school and an art gallery on her latest visit to Somerset. When Her Majesty arrived at Castle Cary train station earlier, she was greeted and cheered on by hundreds of pupils from local primary schools. She went to racing trainer Paul Nicholls' Ditcheat yard, King's Bruton School, and the Hauser & Wirth Somerset art gallery in Bruton. 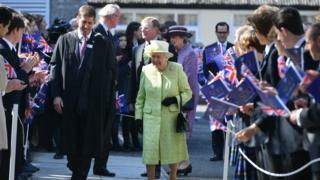 It was her first visit to Somerset since the 2012 Jubilee tour of the UK. At the stables, the Queen met Mr Nicholls before touring the yard and viewing the horses on parade. Speaking afterwards, the trainer said: "It was a fantastic experience to bring Her Majesty to the yard and meet the superstar horses. "I was more nervous about today than I was about the Cheltenham Festival." Mr Nicholls added: "She loved seeing the horses and gave them all a carrot and she knew as much about them as we do. "She saw them run at Cheltenham and she knows what she is talking about and loved feeding them. "I have been lucky enough to meet the Queen several times and she is obviously a racing enthusiast." The Queen also heard from representatives from the University of Bath working on research projects on equestrian sport spinal injuries and racehorse welfare. During her visit to King's Bruton School she officially opened its new music centre to mark its 500th anniversary. She also named a new Avon and Somerset Police horse Windsor during a ceremony on the school's grounds. Her Majesty's final stop was Hauser & Wirth Somerset, a gallery and multi-purpose arts centre located at Durslade Farm in Bruton.